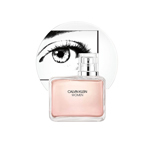 Eternity perfume by Calvin Klein is a romantic, floral scent that breathes with the subtle aroma of a spring garden. Both classic and contemporary, ck Eternity for women echoes timeless quality and modern style. Eternity fragrance possesses a blend of white lily, white florals, marigold and mandarin.